My plan for each summer holiday is pretty simple. It involves BBQs, the ocean, and watching the cricket. This summer we are being treated to an Ashes series, that at the time of writing, Australia has already won convincingly. England were regarded as favourites for this series and Australia has performed well above expectations. But how good are these teams compared with teams of the past? Satyam Mukherjee at Northwestern University has come up with a novel approach to ranking cricket teams. 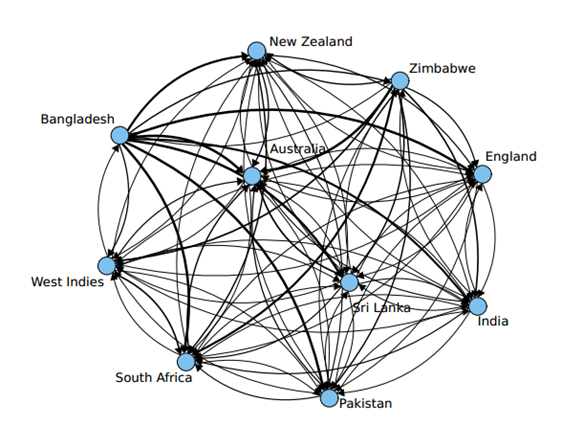 In his paper, Identifying the greatest team and captain—A complex network approach to cricket matches, Mukherjee uses the Google PageRank algorithm to rank the various Test (and One Day International) playing countries, and also the team captains. PageRank works by counting the number and quality of links to a page to determine how important the website is. The underlying assumption is that more important websites receive more links from other websites. What Mukherjee has essentially done is instead of tracking links, he has tracked team wins, so that an estimate of a team's quality is made by looking at the quality of teams it has defeated. After considering all Test matches played since 1877, and all One Day International matches since 1971, Mukherjee identified Australia as the best team historically in both forms of cricket, Steve Waugh as the best captain in Tests, and Ricky Ponting in ODIs. With regards to captains, it is hard to conclusively prove that it was the captain's influence that made them good teams - Australia under Waugh and Ponting were formidable and pretty much anyone could have captained them. This ranking method also only compares teams against their contemporaries. That is, it is not saying that Waugh's team was better than, say, Bradman's 1948 team. It is saying that Waugh's team was further ahead of the rest of the world than Bradman's was in 1948. Unless you have a time machine, it is very difficult to compare across era. You can read more about how the Google PageRank algorithm works in The amazing librarian, and check out our previous article on sporting ranking systems for chess and sumo wrestling. This is of course not the first study to apply objective science to a subjective topic within cricket. In the paper The effect of atmospheric conditions on the swing of a cricket ball, researchers from Sheffield Hallam University and the University of Auckland debunk the commonly held belief that humid conditions help swing bowling. But they don't discount the theory that cloud cover helps. They used 3D laser scanners in an atmospheric chamber to measure the effect of humidity on the swing of a ball, and found that there was no link between humidity and swing. They postulate at the end of the paper that cloud cover may have an influence on swing. Cloud cover reduces turbulence in the air caused by heating from the Sun and they theorise that still conditions are the perfect environment for swing. When a ball moves through the air, it produces small regions of slightly higher and lower pressure at various points around it. This causes the ball to swing. If the air is already turbulent, it is more difficult to sustain these regions and so therefore there is less swing. Imagine throwing a stone into a still lake - the ripples around where the stone lands are easy to spot and move for some distance. Compare this to throwing a stone into an already turbulent ocean - you can barely spot the ripples as the turbulence in the water is much greater than any effects from throwing the stone. If you think about the places where swing bowling has been most effective - England, New Zealand, Hobart - this theory appears sound, however more study is needed to prove it. So I'll endeavour to watch as much cricket as I can this summer, in the name of science. The popularity of Triple J's annual Hottest 100 has made my wonder what my favourite songs of all time are and whether I could come up with a list based on some actual data. The information I have to use is my iTunes data since 2005. 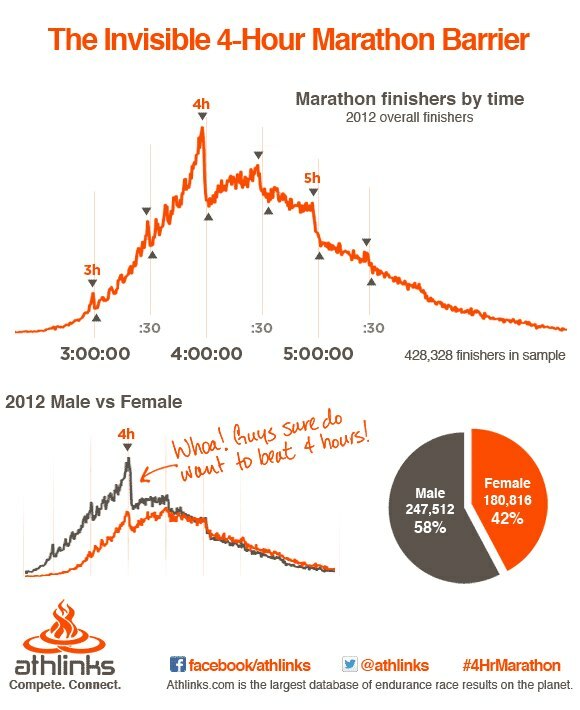 Being only 8 years of my life, this data set is limited. But with any luck (that is, if the assumptions hold true) the following algorithms will stay appropriate into the future and require only minor tweaking. What we're trying to do is come up with a method that will tell me, from my listening habits in iTunes, what my favourite songs are. Whether you actually listen to your favourite songs more than others is a debate for another time. iTunes doesn't tell you when songs were played, just how many times, so the useful parameters we can export for each song are "Play Count" (p) and "Date Added". If we add up all the individual play counts, we get the "Total Play Count" for the entire collection (P). Date Added can be turned into the number of days the song has been in the collection - time (t). We also know the number of songs in the collection now (N) and at various times in the past when I've exported the data. An easy first-cut model is to simply divide each song's play count by its time in the collection and order the songs by this rate of play. As a first attempt this may seem logical, however the problem is that it is heavily biased towards newer songs. You're likely to listen to a song a few times after you add it before it slips back into your various playlists. It also doesn't take into account that there are more songs in the collection now than at the start. What we need to do is come up with an equation that tells us how many times a song is expected to have been played depending on when it was added. We can then compare this number to how many times it was actually played and order the songs by this ratio. This second version suffers from the same biasing problem as the first, but does take into account that the number of songs in the collection is changing over time. This is important as if you assume that you listen to music for about the same amount of time each day, then the more songs you have in your collection, the less likely you are to randomly hear the same song twice. Hence, songs that are played regularly when the collection is small should not be treated in the same way as songs played with the same frequency when the collection is large. N0 is the number of songs in the collection at t0. This model assumes that the number of songs in the collection grows linearly over time (A and B are constants) - that is, the same number of songs are added each month. This is about right for my collection. The integration is left as an exercise for the reader (hint, you get a log function). This final version takes into account that when you add new songs to your collection that you like, you are likely to listen to them quite a lot, independently of the number of songs that are already there - that is, they get added to a "new songs" playlist. The novelty of a new song eventually wears off, so the way we've modelled this is to use an exponential factor. You can tweek the coefficients (C and D) by thinking about the "half life" of a new song. The integration is left as an exercise for the reader (hint, you get a log function and an exponential). The equation now contains two components - the first modelling the number of plays expected through random play and the second the impact of adding new songs to the collection. The model suggests that I play the same number of songs each year (apart from a barely perceptible increase due to the exponential factor) and it seems to work pretty well. This model won't work if and when I swap over to streaming music, as opposed to owning it, as my major form of music consumption, but for now it's holding up. Having played around with the coefficients, the list as it stands is below. It pretty much represents upbeat songs I go running with and songs my 2-year old likes - for whatever reason, he likes Korean pop music! I have to think that the novelty of Psy will wear off over time, but Hall and Oates, they'll never die. National Science Week 2013 - get involved! Mike Hussey says so! And introducing to the world, Hazel Clara West. We're all very happy! She's the baby by the way if there was any doubt... She has a proud big brother. I recently attended the 20 year anniversary of the Sydney University Faculty of Science Talented Student Program. That was an intimidating event! The evening was hosted by Adam Spencer and featured an in-conversation with Professor Bryan Gaensler, Dave Sadler (Bryan's former mathematics high school teacher) and Alison Hammond, a current TSP student. The kind people at the Sydney Uni Faculty of Science have allowed me put the audio up here, so a big thanks to them - all attribution, love and praise should be sent their way. It was a very interesting evening to hear what encouraged one of Australia's most well-known scientists into astrophysics, along with the always witty Adam Spencer. Tune in to this episode here.